Hard to believe it’s that time of year again…but the summer cookbooks are arriving in their legions! and no one’s more excited than me. The NPR summer roundup will be running right around Memorial Day, and I’m hard at work sorting, testing, and hunting for finalists. So far I’ve isolated about 5 of my top 10. But the field is still wide open! This year, in a first for summer roundup, I will be issuing a shortlist as well as the top 10 list. That means you’ll be able to look here for a wide variety of specific recommendations for the best new cookbooks to give new graduates, parents, hosts at summer parties, new roommates, and just about any other food-loving reader you can imagine. new NPR Kitchen Window story: overnight breakfasts! 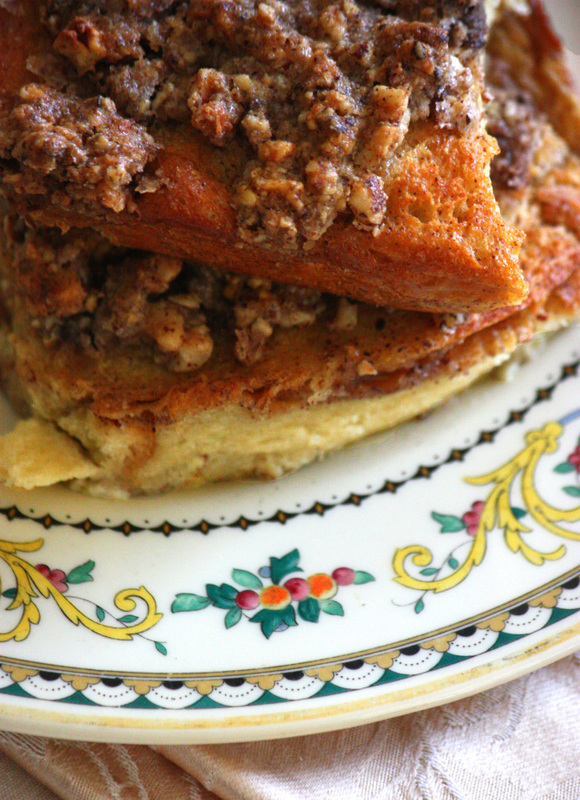 The perfect breakfast…if you’re not a morning person, chances are you haven’t seen one of these in years. But rest assured: it can be done! EPIC FAIL: Anatomy of the Recipe That Didn’t. Yesterday, I tested a recipe of such surpassing inscrutability that I felt it merited a post of its own. Like last week’s memorable disaster, it was a sort of pie. But unlike last week’s, the fault could not be chalked up to user error. Ingredients in the instructions but not in the ingredient list: Having assembled all my ingredients, I proceeded confidently to the recipe. But when I got to step 7, I read: “Line the bottom and sides of each crust with 2 pieces of prosciutto.” Prosciutto?! No one said anything about prosciutto! Surprise! I skipped it. Ingredients in the ingredient list but not in the instructions: The recipe called for a tablespoon of orange zest, but no zest was to be found later on in the recipe. I guessed, and added it to the meat filling. Incorrect yield: The quantity of puff pastry, rolled between 1/8″ and 1/4″ thick, was supposed to yield 8 pies, including pastry lids. I rolled it thinner than 1/8″ and had only enough for 6 pies and 3 lids. (Offering the weight of pastry used would have helped. But equivalent weights were offered for every ingredient except the pastry.) I improvised lids out of scraps. On the other hand, I had four times as much filling as I needed. I made sausage patties to use it up. Inadequate testing: The laws of physics did not endorse this recipe. There is no way to stuff a floppy 6″ circle of pastry into a flimsy 3″ parchment cylinder to create a cup shape. You can do it if you semi-freeze the pastry into the hole first, and then add the parchment–so that’s what I did. Once you’ve got the parchment cylinder in place, there is no way you are going to get more parchment–and weights– inside that 3″ cylinder to line the pastry. I don’t see how this recipe could have been tested in a muffin pan. I have to guess that the author simply baked it in her cake rings and then wrote the alternative, thinking, this ought to work. Unexplained technique: “Stamp a 1/4-inch hole” in the pastry lids. With what–my 1/4″ hole stamper? You’d need a very strong straw, or a knitting needle or something. Whatever it is, it needs to be described. I simply cut an X. Technique required but not offered: We’re instructed to affix the (frozen) lids to the (pre-baked) crusts. How? “Press gently”. This is like trying to stick plastic to wood. You can press all you like, but it’s not going to stick without adhesive. Egg wash might work. Timing inaccurate: The pies were done 15-20 minutes before the stated time. This turned out to be mostly a blessing, since I was now horribly behind and the mob was at the door. Didn’t look like the photograph: Needless to say. The author’s final product was a smooth-sided, golden little pot with a neatly vented lid on top, a bit like a chef’s toque. My wavy-walled, falling-apart, top-askew pie tasted fine, but was not even near ready for its closeup. The point is that it can’t have been tested as written. The results? Edible, even tasty, after I fixed the recipe as best I could on the fly. I’m comfortable working with puff pastry, and I’m used to salvaging dinner out of recipes that are turning sour. But I don’t think the normal weeknight cook should have to go through this after shelling out $29.95 for the book. If you’ve read my reviews before, you know I don’t like to go to the dark side, much. Mostly, I try to appreciate what the author was trying to accomplish. But sometimes, it’s not you. It’s the recipe. I’m not disclosing the name of this recipe or the book it’s featured in for now. However, the review will likely be running in a few weeks. Keep your eye on this space, and I guarantee you will know it when the review appears. 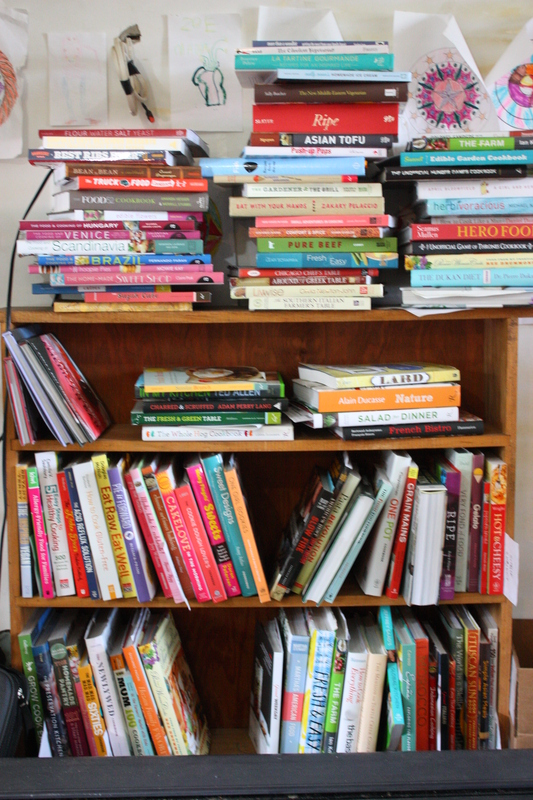 Read my Eat Your Books post on first-love cookbooks. A very sympathetic and heartwarming review of A Spoonful of Promises in the International Examiner, a Seattle-based biweekly publication focusing on the Asian American community. Thank you, Janet Brown! I’m so very glad you enjoyed reading the book as much as I enjoyed writing it. I am testing pies this week. (Yes, I know, poor me. Taking one for the team again.) Today was key lime tart and strawberry-rhubarb crumble pie. All day I made dough and fillings. The tart dough and filling for the key lime came together in an instant, with enough leftovers to make a second small tart–luckily, as it turned out. 50 minutes later, things were looking golden-brown and luscious. It was time to remove the pie to the cooling rack. To pick up the pie pan I grabbed a spatula in one hand and a dish cloth in the other. Couldn’t find the long spatula, so I took the short one. I’ve done it a million times, and the cooling rack was two feet away. No problem! Pie-mageddon!. . . pie-pocalypse!! I shrieked once and stood there, frozen above an 8-foot zone of strawberry-rhubarb pectinaceous destruction. A long moment passed, and then Husby came to my rescue with the bench scraper and the compost bin. 10 minutes later, the 4-hour, 4-pound pie was food for crows. Even the Titanic did not founder more decisively than this. I think you know the rest of the story. Roundups and Kitchen Window stories, as always, can be found on their own pages. Well, I said I’d do it, and I have. A couple of days ago, I made the famous Capitol stew which made such an impression on Katniss Everdeen (Chapter 9 of The Hunger Games). Lamb and prunes! a winning combination any day, so it wasn’t much of a risk. Here are the ingredients, as given: lamb, flour, olive oil, garlic, onion, beef stock, white sugar, brown sugar, carrots, zucchini, celery, onions, potatoes, prunes (dried plums), thyme, rosemary, basil, parsley, bay leaves, ginger ale. Because I wasn’t doing a formal cookbook review, and stews are forgiving, I played it pretty casual with this recipe. I fiddled with the proportions (more vegetables, fewer prunes, less sugar). I used my own favorite technique: brown the lamb on one side in a cast iron skillet, brown the other side by sliding the whole thing under the broiler. I rushed it to a hungry family, and we all dove upon it. I meant to take a picture before grabbing a fork, but by the time I remembered, all the plates looked like this one. I first remember coming across Crescent Dragonwagon when I read her Alligator Arrived With Apples: A Potluck Alphabet Feast to my children. Great message! I thought, turning the colorful pages with their healthy array of fresh foods and whimsical animals. Great name! I thought, looking at the author’s byline. It was a surprise when I realized she wrote cookbooks, too, and this month I finally had a chance to to try one. Bean by Bean: A Cookbook is full of vibrant ideas for the often boring bean. At least I thought so. After a week of beans, my kids, predictably enough, thought she should stick with the children’s books. 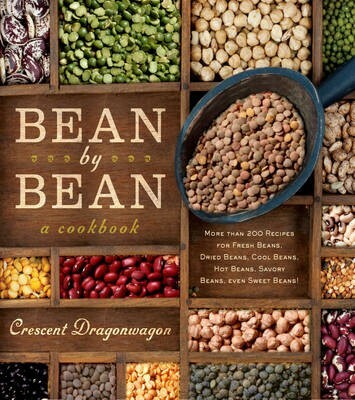 Click here to read my review of Crescent Dragonwagon’s Bean by Bean. I set the deadline last week, so the packages have been rolling in at speed. 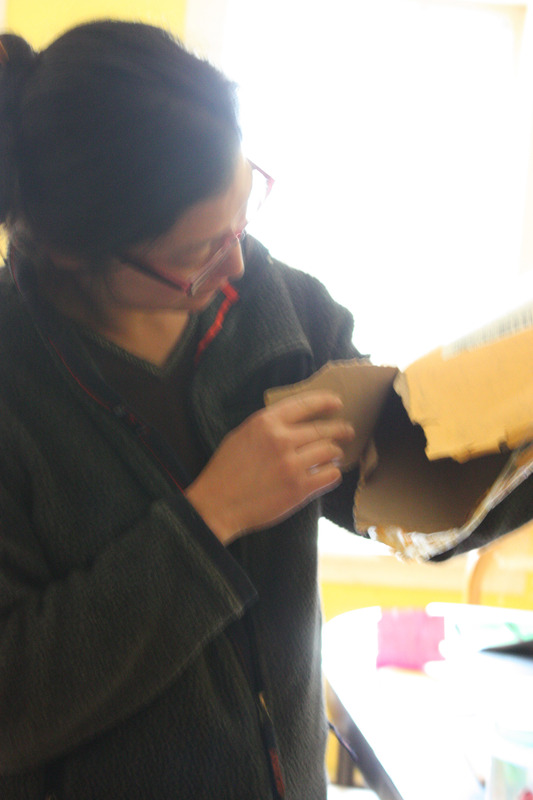 Every season, though, there’s one–the Mysterious Empty Package, hastily sent by a tired, hard-working cookbook publicist. Either that, or it’s the Invisible Book of Invisibility (first encountered in Harry Potter and the Prisoner of Azkaban). At least it wasn’t sent Delivery Confirmation, like last year’s. For more Tuesday silliness, here’s my Eat Your Books post on bossy cookbook titles.